Just finished Dad's Guide to Pregnancy for Dummies. An easy and very informative read, covering everything from conception (though I'm apparently already an expert at this), through all three trimesters, the birth itself, and some of the earleist weeks of caring for a baby. Amber has observed that it actually has more useful information than her own girlie pregnancy book! If you don't like much reading, or paying, there's also the cheat sheet. Most people know that it's good to read to your baby - it helps them associate with your voice, plus they start to recognize speech patterns. What I didn't know is that it's also a good idea to mirror the baby sounds that your baby makes. By repeating their sounds back to them, they start to understand the cause and effect of the sounds they make. I'd heard of cesarian sections, and natural birth. I'd never heard about vaccums or forceps. Or knew that they can mess with baby's head. Or, if the head gets into a weird shape, you need to have your baby wear a special head-shaping helmet 23 hours a day. You want your baby to feed for 10 minutes on each breast, because apparently the most nutritious part of the meal comes at the end. And the one scariest thing I read: postpartum psychosis. WTF, my wife was a 1% chance of going into paranoid psychotic episodes and will try to kill me? Baby's first ultrasound, 5 weeks. Mike: whew, there's only one in there. Ultrasound at 8 weeks. We saw a tiny flicker of a heartbeat, at a healthy 160 BPM. Something is alive in there! Hi, I'm Michael. My wife Amber is eight weeks pregnant. 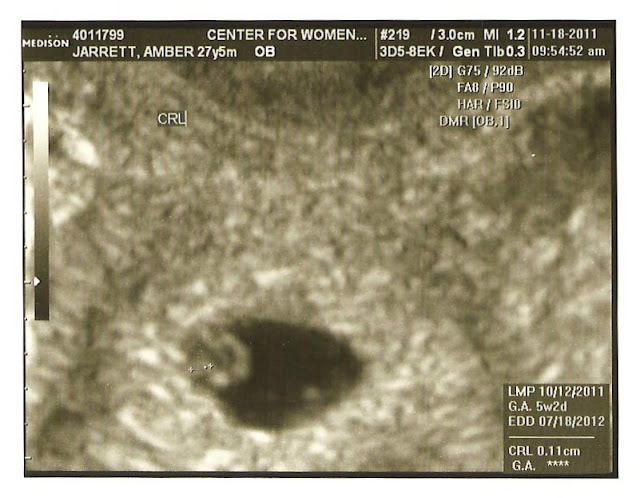 Assuming things progress the way they should, a mini Mike-Amber hybrid should pop out of Amber on July 18th, 2012. So, why make a blog about it? Well, I was inspired by something my parents (and I'm sure many of their peers) did as their children were growing up. They built a photo album with highlights of childhood; class photos, sports teams, vacations, family holidays, report cards and even some awards. It was an sentimental experience for me to go through those artifacts, nearly 30 years from when the album first formed. Even better for my wife, who got to see some of my early years. On the other hand, it's 30 years later, and photo albums are for suckers. We have computers. Why a scarce collection of photos and handwritten labels, when instead we can have a limitless multimedia extravaganza of whatever content we may want to preserve? A blog is the perfect presentation format - it's chronological, can include almost any content including the inevitable barrage of pictures, and is easily shared with others. I intend to start more like a journal - track key stats and milestones of the pregnancy. A few personal musings on the pregnancy process may slip in as a reminder of my state of mind. After our child is born, all the focus is on them - a living chronicle of our child's time growing up. Still, I will try to keep it brief - highlights really - without succumbing to the temptation to ramble on for pages or hours of video of napping baby. I hope that in the future, Amber and I, our families, and our children, will all be able to enjoy looking back through the content, much like the photo album my parents made of my time growing up. This blog is currently public, but I will likely lock it down to family and close friends in the future.